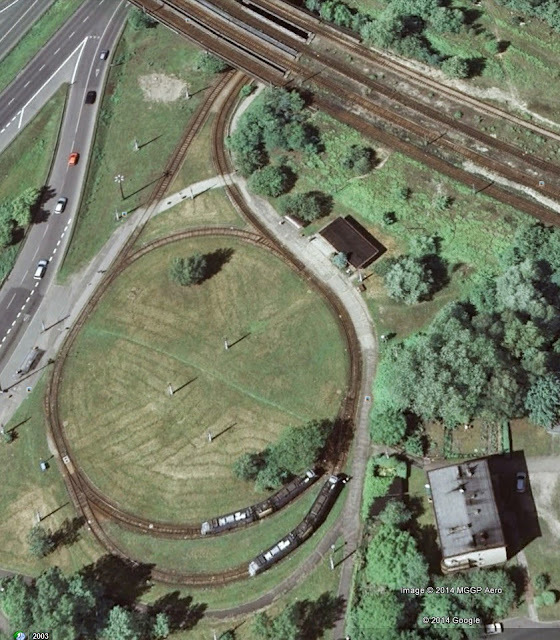 Exploring the wonderful Slaskie Tramways in Poland, via Google Earth and Google Maps, I discovered another terminus that can only be described as a real life micro layout. Using the scale on Maps, it measures about 200 feet by 400 feet, or about, if my maths is correct, 20cm by 40cm in N scale. In this smallest of spaces it features a continuous run, passing loop and twin exits to a fiddle yard via a genuine scenic break. 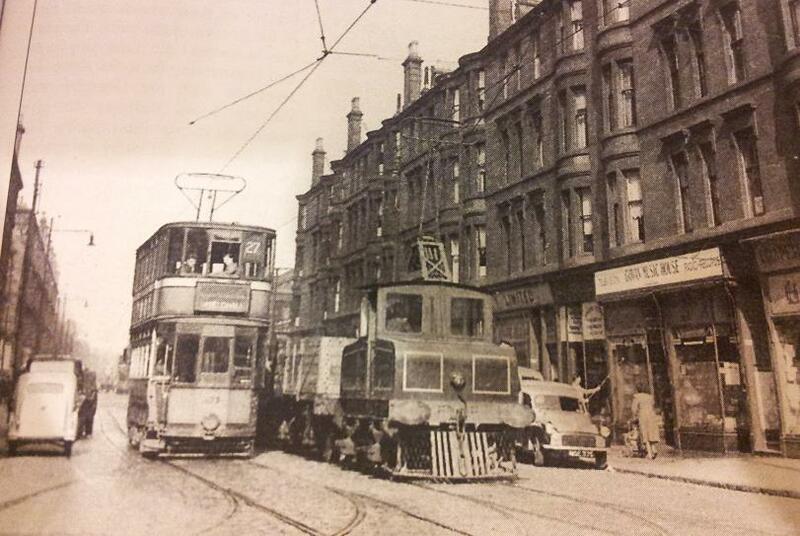 The last tram ran in Leicester in 1949. Despite this, there are a good few remains still to be seen, more so than in some other places where they lasted longer. My favourites are the two remaining depots. Until a couple of years ago, there was also the main depot at Abbey Park - sadly this was pulled down in favour of yet more, so far unbuilt, flats. The most interesting one is Stoneygate on the southern edge of the city. 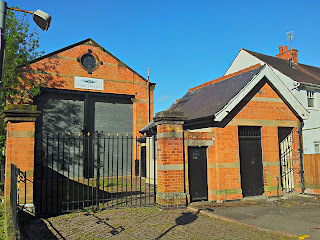 As can be seen, the twin track depot retains its gates and ancillary buildings. I've felt for a while it would make a great microlayout on its own. I'd like to have a go at building it in 1/64 scale to display some of the Corgi trams I've acquired over the years. I'm not even sure it would need motorising though I'd like to keep my options open. 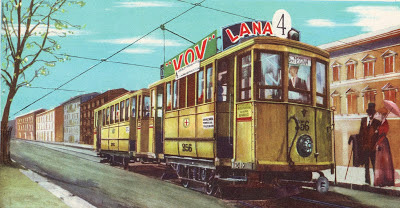 In use until 1922, the depot held 6 tramcars. In fact, it might do once more at some point in the future, as its just been leased by the Leicester Tram 31 Group. They own the remains of (rather obviously) tram 31 and are gradually restoring it. They face something of an uphill task however as a number of parts were removed from it by Crich Museum when they restored its sister, number 76. It would be lovely to see a restored Leicester tram back in an original depot one day in the future. 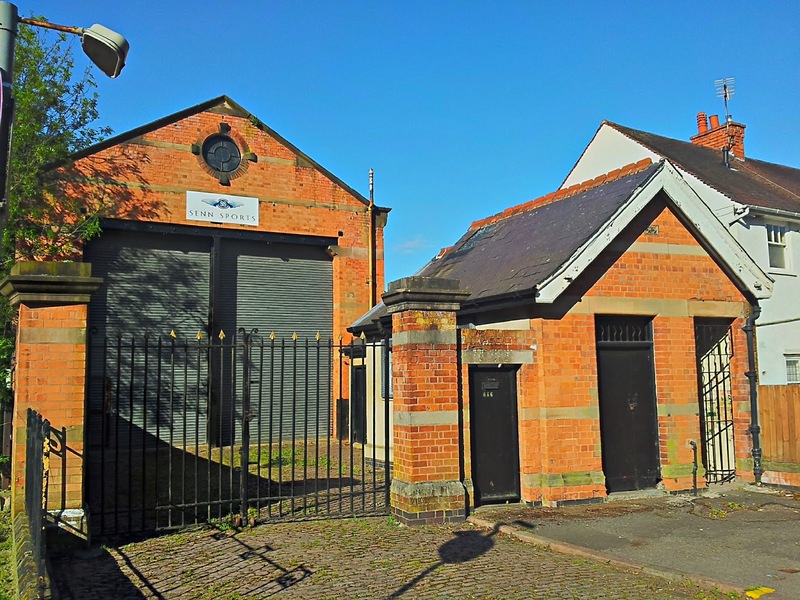 One benefit of the building being taken over is that the Digital Building Heritage Group of De Montford University have carried out a full survey and reconstructed it digitally in its original condition. 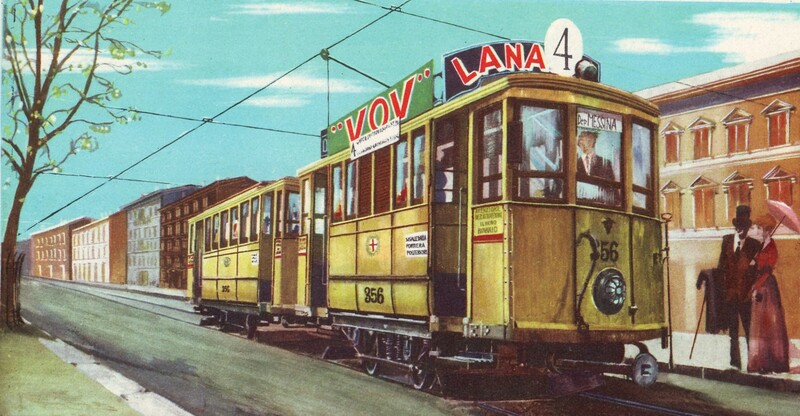 They've also modeled one of the tramcars in its open top condition and plan to 3d print this to give the public greater awareness of their tramway heritage. The Narborough Road depot also survives, though this is still in use as a food and clothing wholesaler so isn't in such a well preserved state. Having said that, apart from the addition of a mezzanine floor, it's probably fair to say the absolute minimum has been done to the building, and standing inside the 'wellcome Supermarket Ltd' downstairs (nice people despite the spelling howler) it's not difficult to see the building's origins. 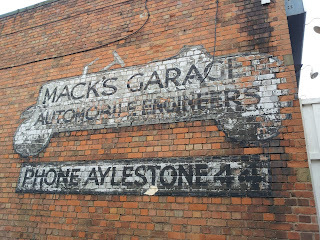 On the side wall, a lovely bit of history remains. 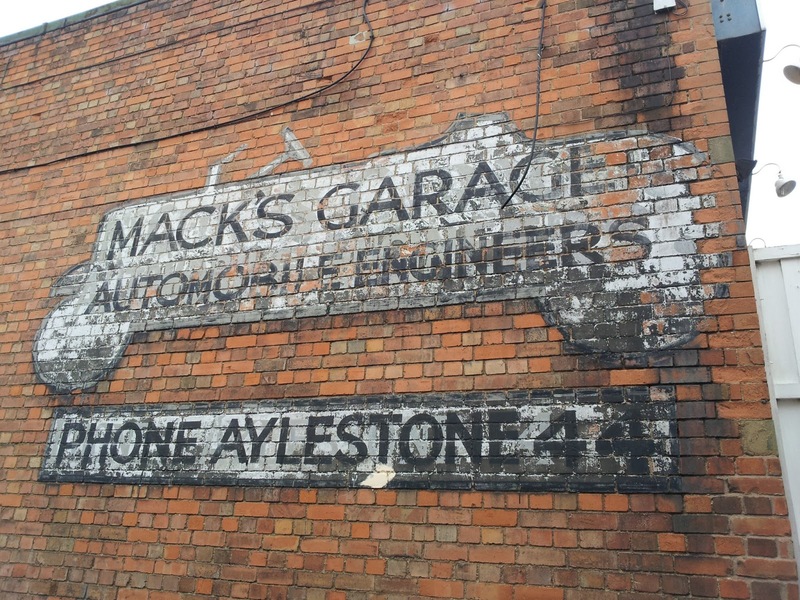 The telephone number - Aylestone 44 - shows this advertisment's age just as much as the period motor car used as a background. 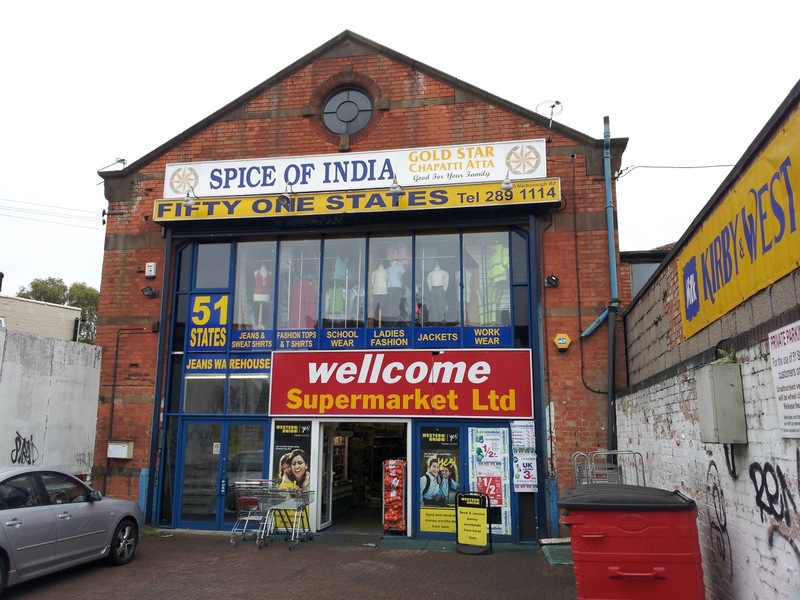 Watched this for a few days on eBay - since it went for just over 100 Euros there was no way I was going to place a bid, but it did bring back forgotten memories of the old Roy's Bargain Store, later the Railway and Barter Shop (spot the connection), once son of Roy took over, back in my old home town of Long Eaton back in the 1970s. When I first discovered it the shop was an unlikely combination of junk, such as dodgy cameras and cassette recorders, and model railways. Initially this was virtually all secondhand, Hornby Dublo or tinplate and the like. As time went by, new stuff gradually took over. By the time I left town in '79, it was pretty much a normal model railway establishment. 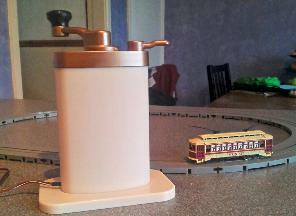 For a while, in the centre of the shop was a Rivarossi tram set, trundling around inside a glass case. 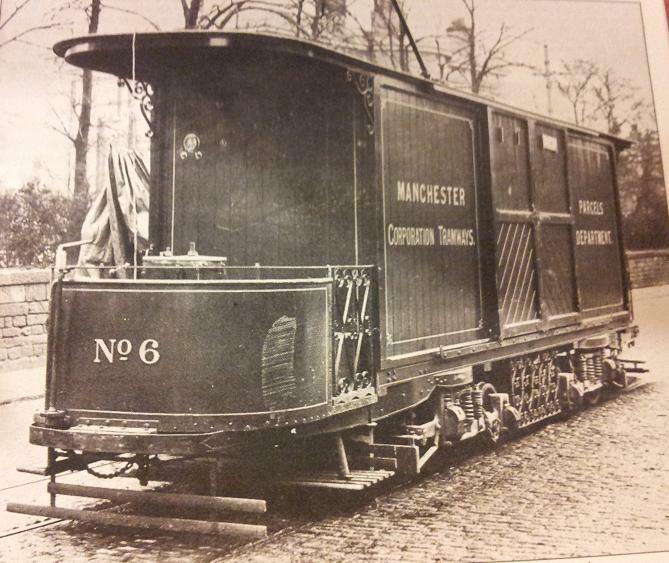 It was a complete tramway in a box - an oval of roadway and the all important overhead wires were included in the set. At around 2 square feet it was also one of the original micro layouts, way before such things actually existed. Looking at the eBay pictures, I'd forgotten what a good looking model it was. Considering that it came complete with overhead, working I believe, there's nothing like it available today. Of course, with Rivarossi part of the Hornby International empire now, it's possible it could be relaunched some day, though I doubt it - they seem ken to stick to safe bets, like Union Pacific Big Boys to guarantee a quick return on their investment. Good news for shareholders, less so for niche modellers. In any case, looking at the way prices have shot up since the relaunch there's no way I'd be able to afford the set if it were reintroduced, so perhaps it's better this way. Is the title of the book that arrived today, courtesy of eBay. 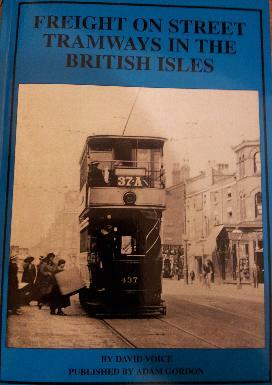 It's by prolific tramway author David Voice and does exactly what it says on the label. Although there are a couple of lines that to my mind stretch the definition e.g. 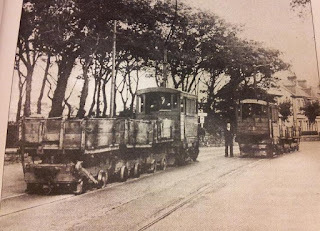 the Glyn Valley Tramway, it contains a wealth of ideas to spice up operations on a model tramway. Some of these I knew about already - anyone who's visited Crich will have seen the Blackpool steeplecab for instance - but there were many more I was unaware of. Manchester parcels tram. 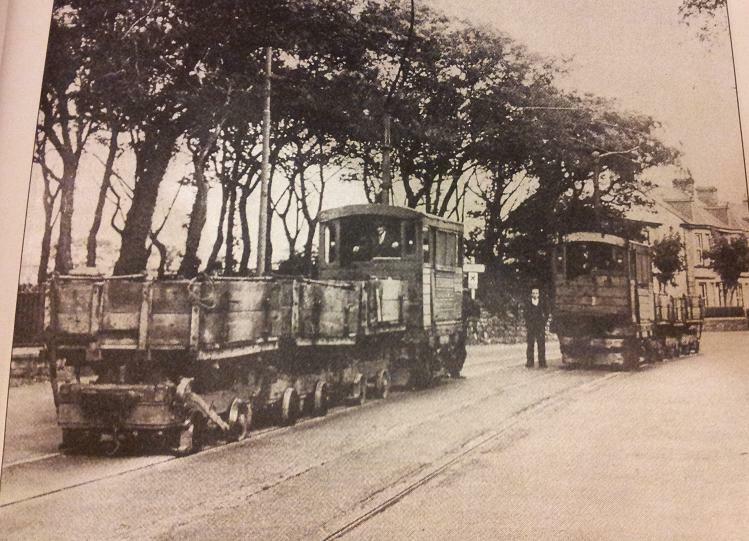 Same day delivery of parcels was guaranteed anywhere in the city provided it was posted by 3.45 p.m.
Two trains of tin ore on the Cambourne and Redruth in Cornwall. One operation I knew less about was in Glasgow, where freight locomotives were used to deliver main line wagons to a couple of shipyards in Govan (avoid Rab C. Nesbitt reference...). Glasgow tramways, like a few others, were laid to 4' 7 3/4'' gauge so that main line wagons could run on their wheel flanges on the grooved tramway street track. And of course, the ideal locomotive to model such operations in n scale would be the tiny Deki 3 from Tsugawa Yokou. Most of what I know about wiring was gleaned many years ago from careful study of the works of Cyril Freezer, especially the iconic 60 Plans for Small Railways, which I pretty much wore out as an early teenager. Reverse loops were tricky, necessitating something called a DPDT switch, otherwise short circuits would occur, the universe implode - you get the picture. As far as I knew, this was still the case today - even the new fangled DCC seemed to struggle - I notice Bachmann make a special reverse loop module for their Easy Command line. Not a massive problem when you're modelling a railway perhaps, reverse loops being quite rare beasts, but tramways are a different matter. Most of my favourites, the Silesian system I 've discussed previously for instance, have a fair number, so naturally I wanted one too. Whatever CJ said. Googling around at the weekend for information about Tomix insulated railjoiners, I came across a message on the excellent Tomix and Tomytec model railway group on Yahoo, by Nick Kibre (message 872 if you're interested) that said the Tomix turnouts were power routing and no extra railgaps were required for a reverse loop. To be honest, I doubted it would work - it went directly against the world according to Freezer, but I dutifully set up a quick test rig in the kitchen, using my 6 volt battery controller so that the consequences wouldn't be too dire when the whole thing blew up... Only to find it worked. Perfectly. Thankyou Nick Kibre and thankyou Tomix! I love the minimalist layouts built over the years by Ian Futers. I've tracked down magazine back numbers featuring them, been to at least 4 exhibitions simply because one of his models, sometimes under new ownership, was there, I even have a part finished 00 gauge pastiche of Newcastle Haymarket warping nicely in a rather damp loft. work. When he went on to mock up a tram terminal using the Newcastle Hamarket track plan, I began to wonder what the actual model would look like if it were updated, as if it had been incorporated into a modern rapid transit system. 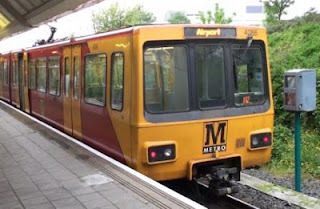 In fact, if the station really existed, it might well have become part of the Tyne and Wear Metro, which uses high level platforms, some of which are ex railway, with tram style articulated cars. 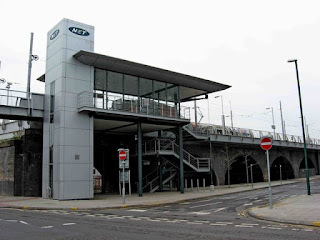 In Nottingham, our local tram system, the southern terminus is on the old Great Central Railway viaduct, which ran over the city before plunging into a tunnel through to Nottingham Victoria Station. The pre-tramway shot, above, shows the location. Trams now approach down the street on the left of the photo (the tunnel mouth through to Victoria can just be seen) then swing onto the viaduct. The brick part has been replaced by a modern concrete structure, once over the road in the foreground the original structure is used. At the end, a modern tower-like building, see left, provides access to the platforms. Since it was only built for plain double track, the viaduct has been widened using a metal structure, topped with a concrete deck. The rails are set into the concrete. The station throat is a scissors crossover, allowing access from the double track approach to either platform. Beyond the buffers, behind the camera, the original Great Central crossed Station Street, then went over the four platforms of Nottingham Midland station on a huge bridge, now demolished. With the news this week that two more routes are to be added to the Nottingham network, this scene will soon change. Tracks will again run southwards from here and a new bridge will be built over the Midland station, still in use. Returning to Haymarket, the viaduct here includes platforms, so unlike the Nottingham example, no widening would be necessary. The original station building would be demolished and, since the trams are much shorter, the line would be cut back, probably at around the white noticeboard seen on the booking office wall in the picture to the left. A tower, with lifts, would be built to give access from street level. With the bridge removed, a small plaza, with flowerbeds, could be set around the street entrance. 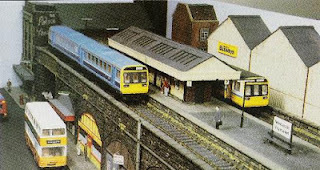 Were I to try this in N gauge, and I'm very tempted, I'd add a loop at street level for my Tomytec moving bus, emerging from under the far bridge, that looping back round through the new 'Station Plaza', to return behind the backscene. Tomytec produce 66mm radius curves so the layout would easily fit onto a 20cm wide board. A new take on an old idea, and a real salute to an inspiring railway modeller. My battery powered Tetsudou controller was delivered yesterday. I unpacked it excitedly, sat my Bachmann streetcar on the track and - nothing!! Well, the lights came on, but that was it. Tried posh Duracell batteries, still no result. I then tried the batteries directly on the tram - still nothing, so I guess 4 AAs don't put out enough juice for the Bachmann motor. I found a 9v PP3 in the cupboard and connected it to the wheel - this resulted in a reasonable pace. Since I really like the controller and being able to operate away from mains power, this leaves me two options. I could fit a PP3 into the device. It comes apart easily enough and there's more than enough room. My only concern is that there's a fair bit of circuitry at the top and I don't want to burn it out with a 50% voltage increase. Has anyone else run them successfully with an uprated supply? The other alternative is to stick to models that work on 6v. I'm not particularly in love with the Bachmann - it was secondhand so I should be able to sell it on without loss, and I was going to order one of the TM-TR01 based models anyway, plus a Portram or two when the chasis comes back on sale. Being Tetsudou models, these must work with the original setup? If I take this route, am I painting myself into a corner regarding future acquisitions? In particular, I could be tempted by something from Modemo in the future.